Organizers of the Michael Bloomberg-funded group Moms Demand Action aren’t exactly known for their honesty. A misleading photo taken at the group’s rally in Nashville, Tenn., during the NRA Annual Meetings & Exhibits in April isn’t going to help that reputation any, once the word gets out. 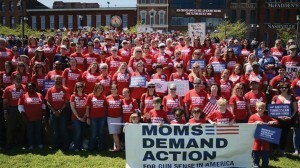 NRA-ILA recently reported that Moms Demand tweeted the photo (above), along with this statement: “Just blocks from the NRA convention, hundreds of moms, dads and kids gathered today to show that we’ll go anywhere to bring the message of gun sense to America! Join our fight, we’re just getting started.” Apparently the group wanted people to believe there were about 400 protesters in attendance, since that’s the number they publicly promoted beforehand. 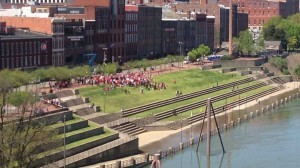 That photo that supposedly shows “hundreds” of protesters was taken at the same time as this photo (below), which shows there were only about 100 protesters present. So why the big difference in the two photographs? An astute observer at gunfreezone.net revealed the group’s “trick.” As he explained, the anti-gunners exaggerated the size of their miniscule protest by staging their photo with a small group of them standing on higher ground, well behind the front group, trying to conceal the optical illusion-inducing gap separating the two. The result—a photo that seems to show more protesters than were actually there because a viewer would assume the gap in the middle was also filled with people. But by looking at the size of the heads in the back of the first group compared to those in the back group, it’s easy to see lots of empty space separates them.